On Tuesday I didn't get much of a chance to do any shopping. The last few days we've had to scrounge together a dinner of leftovers, take out, and sometimes just strange combinations of different canned items from the cupboards. Some would say that a simple trip to the grocery store could alleviate some of these problems. Some simply have no sense of adventure. 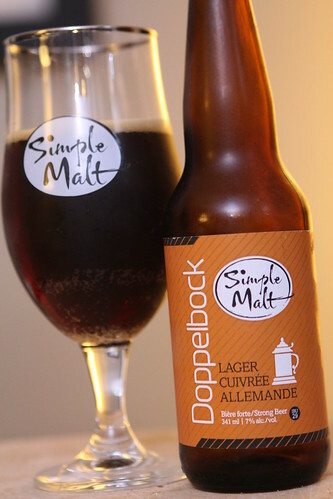 After work I had another beer from Brasserie Illimité, this Dopplebock. I could have sworn I'd had this while in Quebec and that I'd accidentally bought a second bottle. However my detailed beer records indicated that I had not actually had this one yet. Detailed beer records. This is why I'm the coolest guy in town. On Wednesday we had a little piece of history to go along with our shabby, cobbled-together dinner of leftovers. 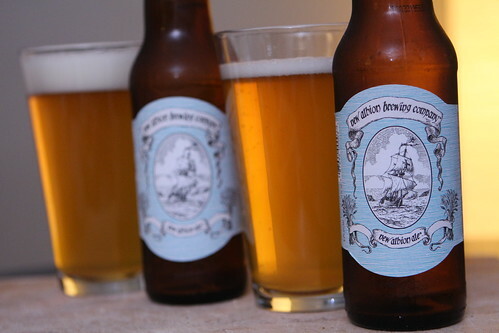 What we had was New Albion Ale, the original recipe for the original American craft beer. This beer was originated by New Albion Brewing Company (actually brewed by Sam Adams early this year when they acquired the trademark). This was a very nice pale ale. There is nothing that jumps out about this beer as being out of the ordinary but, apparently, when it was released in the 1970s it blew people's minds. I can understand how that would be the case if all you'd ever had was Miller, Coors, or Budweiser. It's a very good beer that is easy-drinking and lends a nice bit of historical perspective to the craft. On Thursday the Wombats had their nine month check up. Apart from not enjoying their latest round of shots it went smoothly. Except for when they temporarily tried to remove all the various instruments from the rack above their heads. And when Elliott tore off giant pieces of butcher paper from the table underneath him and tried to eat them. They were ranking quite nicely on the spectrum falling somewhere between the 25-50% range. Shockingly their heads are still the same size. When I commented on this the nurse actually measured Elliott's head a second time to make sure she hadn't gotten it wrong. She hadn't. Their heads are simply the world's most elaborate optical illusion. I got a call early the day before announcing that the day care would be closed on Thursday because they didn't have any running water. I just happened to have the day off of work so that worked out nicely. This did, however, throw a monkey wrench into my plans which were to bring our apartment from the level of festering cesspool to somewhere just above intolerable. 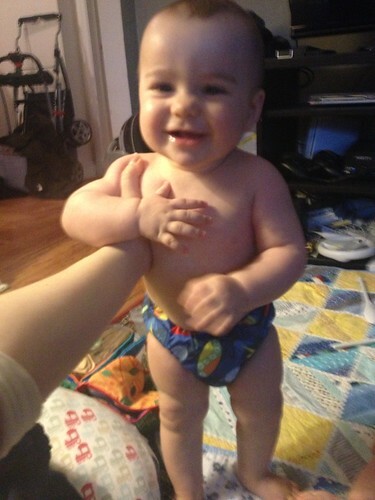 Martin had a fun time in the afternoon attempting to make an escape from his newly-lowered crib. 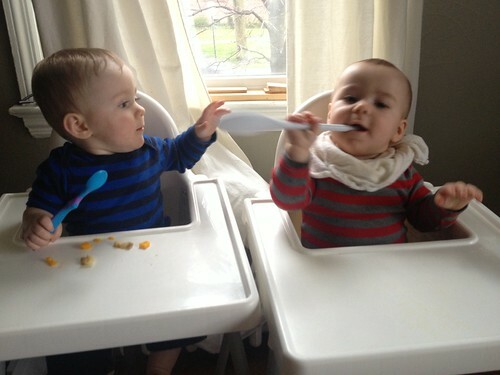 And in the afternoon they both had endless fun cracking each other up with their special brand of baby humor. 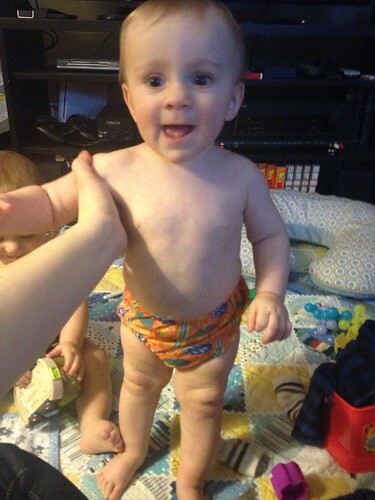 They have been enjoying bath time more and more each day and Thursday they had a great time splashing and, for some reason, frantically squealing while we attempted to dry them and get them in pajamas. 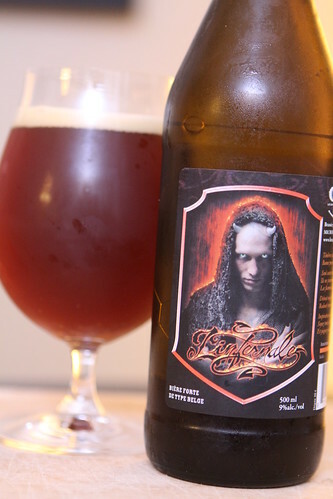 After bath time I had another Quebec beer, this Infernale from Le Grimoire Microbrasserie. I bought this beer mostly because I found the label to be extremely comical. There is a range of beers from this brewery that feature a selection of demons and shirtless women on the labels. This one, I thought, encapsulated the style the best. The guy on the label kind of reminds me of Randall Flagg as imagined by someone with a 1998 copy of Adobe Photoshop who just got a new pack of filters that he wanted to try out. This keeps in line with the oddly heavy metal reminiscent flare of many Quebec breweries. I wasn't crazy about the beer but the label made it all worth it. It was second only to that bottle of Clairette we saw when we were in Die in 2008. Now that was pure class. 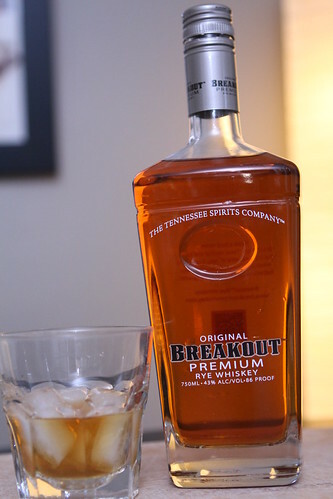 I also sampled a small glass of whiskey that was given to me by a friend as a late birthday gift, this Original Breakout Premium Rye Whiskey from The Tennessee Spirits Company. I am not an expert on whiskey other than I can say that it was good. I drank the whiskey. It was good whiskey. I liked it. The rope was burning my hands. I pulled it anyway. The sea is fickle. This morning, as we were getting the guys ready for day care, we got a call alerting us that they would again be closed. I had been the hero yesterday, Jen took the hero's crown for today. In addition to no day care we also lost power because of mild wind. This meant that the small amount of work Jen could expect to get done on a day of caring for two babies was pretty much out the window. Instead she made the most of it by having a fashion show where she modeled the Wombats' new swimsuits for their upcoming swim class. They seemed pretty delighted by it. Let's hope the last eight months of baths have prepared them for a somewhat more enjoyable experience than their first trip to the beach. They did not like it. They did not like the sea. Jen also introduced the guys to the parachute game. 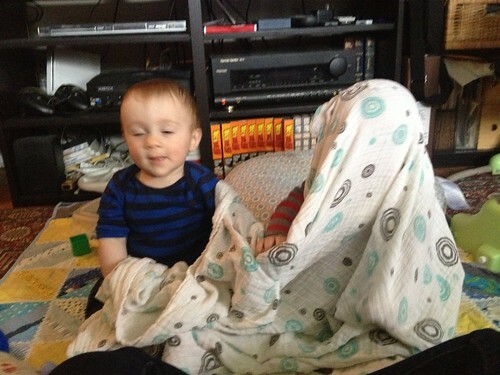 This is a fancy name for putting a blanket on them and seeing who pulls it off first. Martin seemed to win the game. 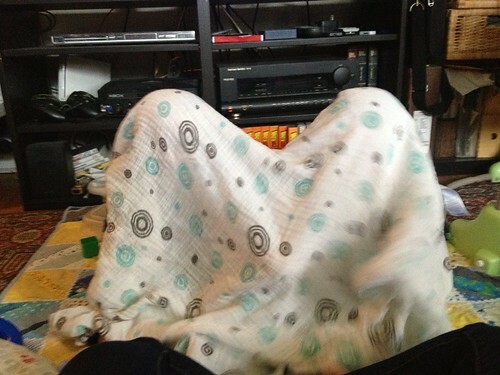 However, Elliott made a very spooky ghost. Behold the haunting specter of the Elliott Ghost! When I got home from work Jen announced that the Wombats will only eat now if you let them hold their own spoons while you feed them. This seemed to be a radical shift in eating habits in the eighteen hours since I'd last fed them but such is the life of the Wombats.